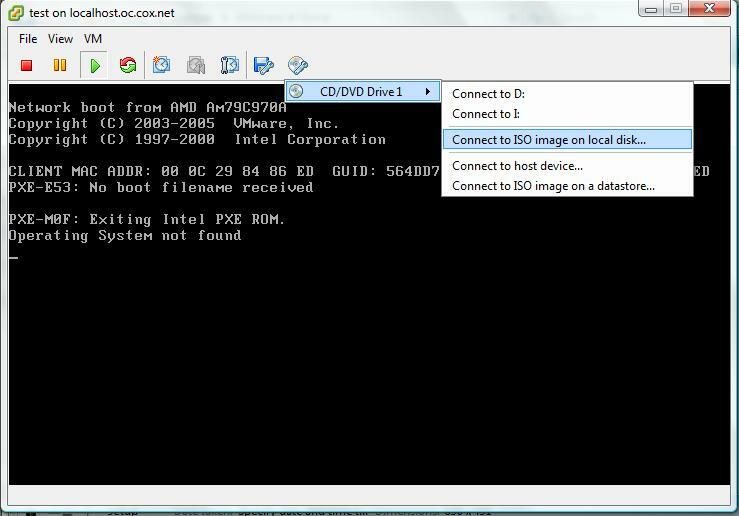 One of the short comings of the original 32 bit Windows Home Server (WHS) for me was the lack of any built in tools to backup the primary WHS boot drive. While using a RAID 1 boot drive would protect me from a disk drive crash, it didn’t offer the capability to “rewind” back to a former backup copy to fix a system drive corruption issue. To compound the problem, my favorite Windows disk image backup utility doesn’t support server based operating systems, presumably because they have a higher cost enterprise class version they sell into the classic server markets. So for most of us, the problem remains on how to easily backup and restore the primary boot volume of the WHS server or upgrading the entire server hardware without losing the current WHS configuration. The good news is that backup and restore for a primary boot drive becomes significantly easier when you are running as a virtual machine. 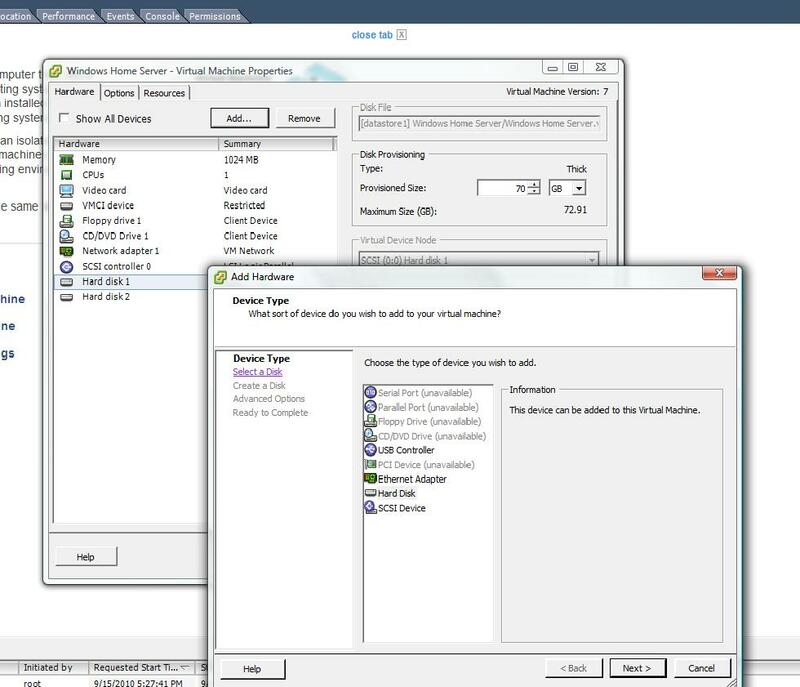 Better still, these come for free if implementing WHS on VMware’s ESXi hypervisor as illustrated in At Home with ESXi posted earlier. 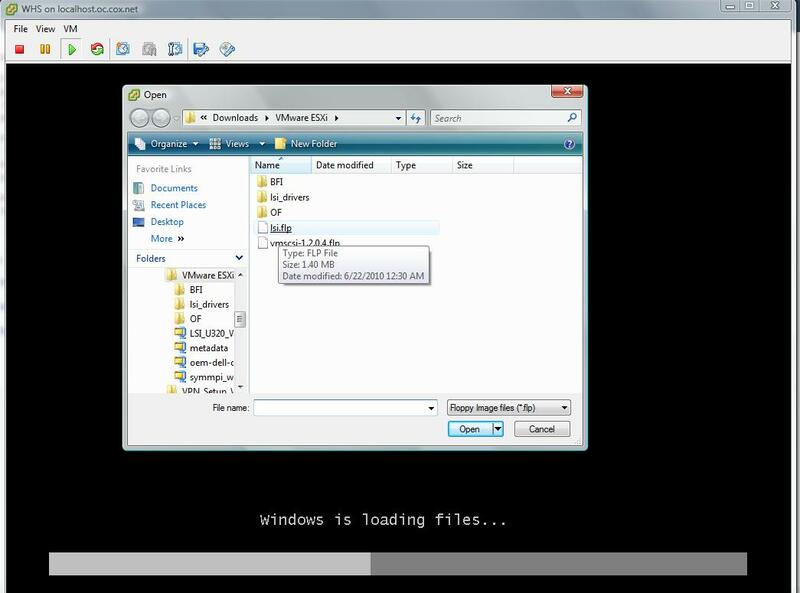 Snapshot – takes a point in time copy of the complete WHS virtual machine on the same physical drive as the primary WHS boot image. Total time around 3 mins and take as many as you have room for on the disk. 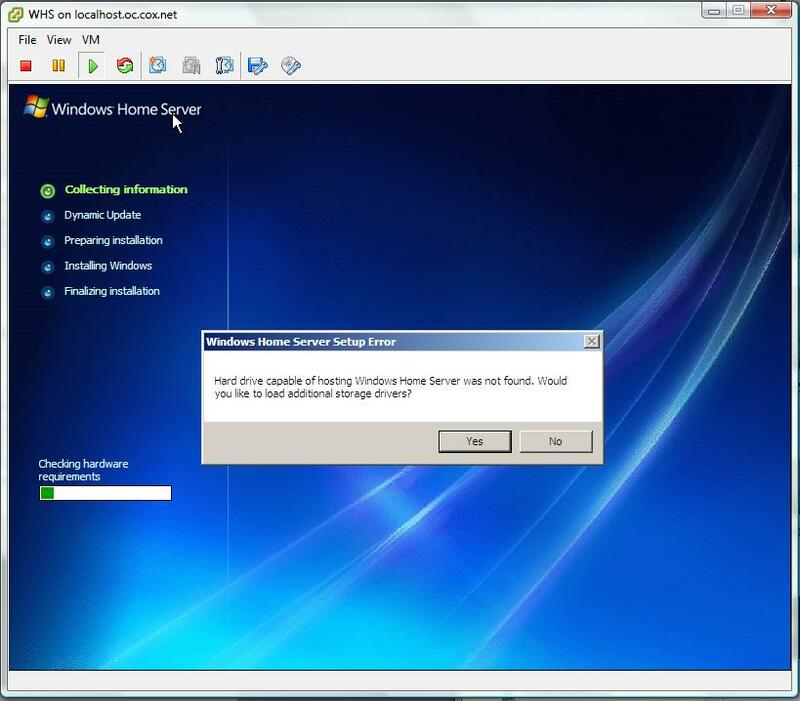 Read more at System Drive Backup Options for Windows Home Server on VMware ESXi. 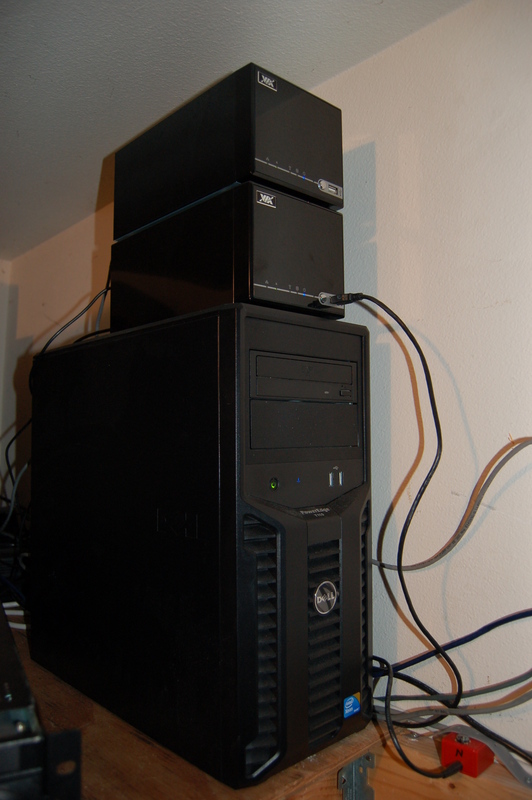 I have now been running WHS since Dec 2007 on a small self-built VIA based ITX system, chosen because it was small and ran on much lower power and generated less heat and noise than a conventional PC or low cost server allowing me to leave it on all the time. It’s worked like a charm since it was turned on in 2007 and not crashed once! Since then I’ve added a second WHS using the VIA Artigo shoebox PC which I use for projects like the Earthquake monitoring project referred to on this site a few months back. We have a pretty active PC home. I have gamer kids (I’m one of them) in the house with 3 dedicated gaming PCs mixed in with 3 laptops (2 college, 1 work), a digital audio workstation for audio and midi recording, plus a home built media center PC in the family room. 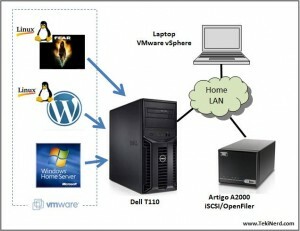 Operating systems are a mix of Windows XP, Vista 32 bit, Vista 64 bit and Windows 7. 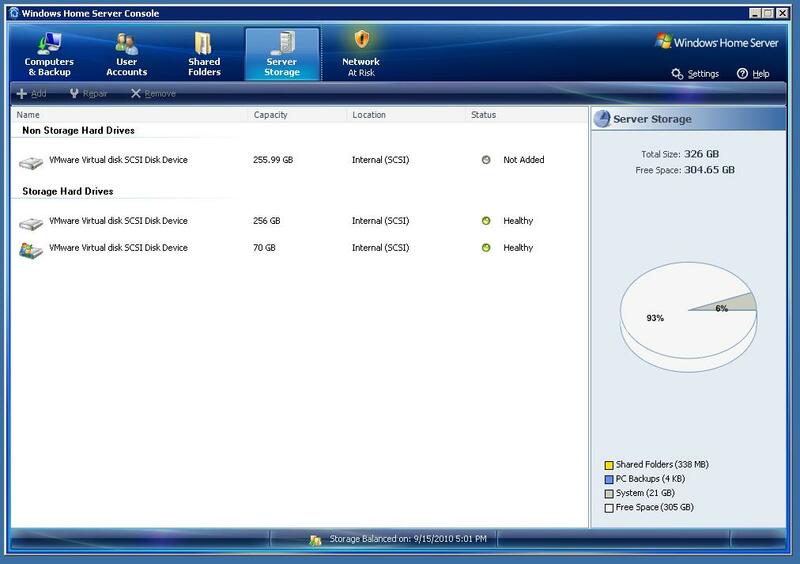 All of the PCs have the WHS Connector software, though only 2 of them (my home desktop and home laptop) wake up automatically to do backup all the time as I found that the laptop would wake up in my hotel room looking for my WHS when travelling! The rest, I tend to run manual backups or turn on the automated backup only when I know the work laptop is going to be stationary for a while or I have a lot of new content I’m creating. Having lost data from my pre-WHS writing days, I’d already developed a healthy habit of making sure I had multiple copies of important data (e.g. photos, audio/midi projects) in multiple locations so I’ve managed to avoid catastrophic loss of personal data with a little careful management so far. WHS really helped automate and simplify this previously manual process. 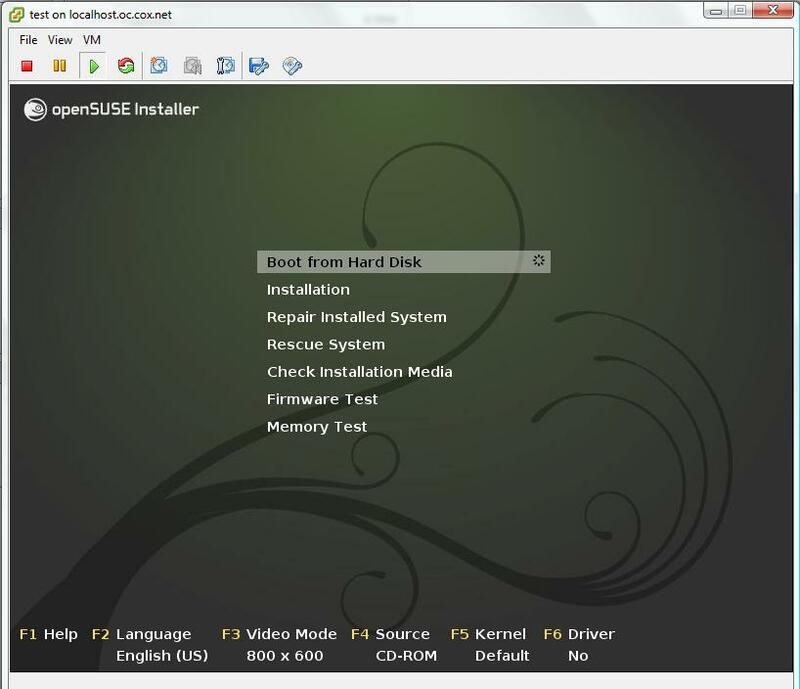 On occasion however, there are situations where a recovery of a complete PC or file is still necessary beyond the normal “copy off your backup USB drive” scenario. I just completed a fun project hooking up a dedicated low power, shoebox sized Windows Home Server to a University of California, Riverside project called QCN, or Quake Catcher Network. My home server now measures vibrations and sends the results to a central network. Very cool. If you have a home server (or any recommended PC/laptop) and live in an area where the ground shakes a lot, you may want to take a look at using some of those cycles when your server is idle. More details on my setup and project at http://tekinerd.com/?page_id=123. Though the backup capability is nice (I have a lot active PCs in my house), the real value of WHS came home to me when I needed to find some old emails from 9 months back that I thought I’d kept when upgrading my laptop from Windows XP to Vista. 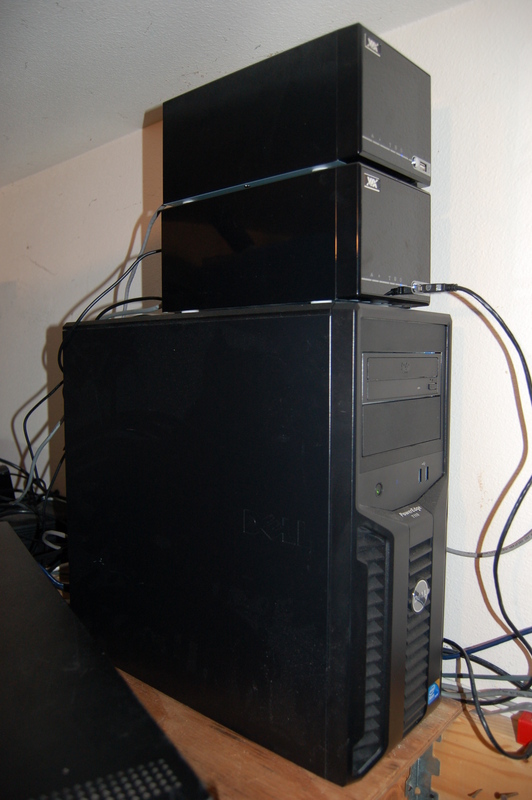 My home server had been configured to keep both the old XP backups I’d been making regularily up until Nov 2009, then it was keeping a new set (under the same PC name) for the newer Vista Operating system I’d installed. A long winded process that took several hours (actually left some of it running over night on the last restore step), but it did the trick and worked pretty nicely. Of course, not as nice and instant as the Apple Time Machine (which wouldn’t have been able to go back to a prior OS install), but achieved the same functionality.